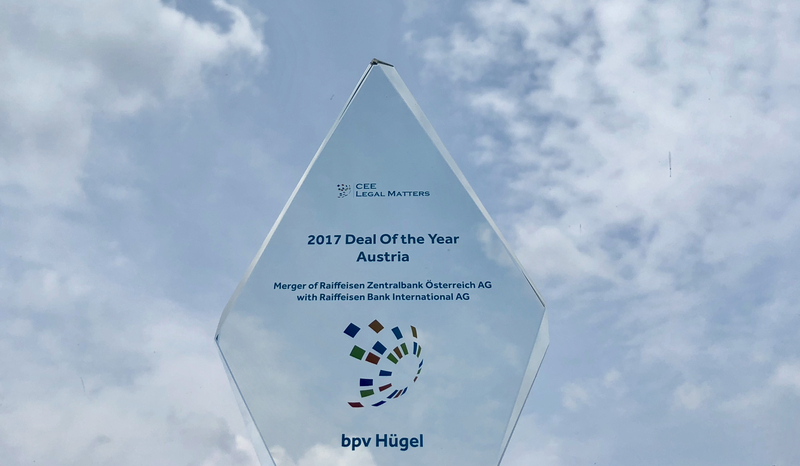 bpv Huegel was awarded with the Austrian Deal of the Year for the work on the merger of Raiffeisen Zentralbank Oesterreich AG with listed Raiffeisen Bank International AG at the CEE Deal of the Year Awards of the leading regional legal industry journal CEE Legal Matters. Moedling/Vienna, 1 July 2018. The Deal of the Year Award was presented for advising Raiffeisen Zentralbank Oesterreich AG (RZB) on the merger with listed Raiffeisen Bank International AG (RBI) by the leading regional legal industry journal CEE Legal Matters at the inaugural edition of the CEE Deal of the Year Awards Ceremony held on 6 June 2018 in Prague. The deal awards are granted on the basis of their complexity, innovation, size and market significance. The merger is considered to be the largest corporate reorganisation in the Austrian banking sector to date. RZB as the lead and central institution of the Austrian Raiffeisen banking group with its equity participations in the financial, insurance and industrial sector was merged with RBI and the syndicate of the eight regional Raiffeisen banks as former core shareholders of RZB are now holding directly the majority of RBI. “We are honoured that our advisory work on the merger has been recognised by the judges for the CEE Deal of the Year Awards. Together with the exceptional teams of RZB and RBI the transaction was structured and successfully executed within the quite tight frame also leveraging on our firms leading position for large cap transaction of listed companies,” comments Christoph Nauer, who was one of the lead partners in the matter. “Congratulations also to the team of Schoenherr winning alongside the Austrian Deal of the Year Award advising RBI on the transaction,” states Christoph Nauer. The awards acknowledge the leading law firms advising on significant transactions in Central and Eastern Europe over the past year. The winners of the CEE Deal of the Year Awards are selected by a two-tiered panel of leading lawyers from across the region.